It seems like it’s been forever since I last did a beauty haul. Actually, I’ve been somewhat neglecting the “beauty” section of this blog. That’s because for a while, I just stopped buying cosmetics. I honestly have more than what I need everyday and upon realizing this, I decided to stop hoarding. Last weekend though, I went to Sephora with the intention of buying a vanilla-scented soap. In the end, I came out with more than what I bargained for, but without the soap I originally intended to buy. There weren’t much options in Sephora for soap so I had to drop by L’Occitane instead. 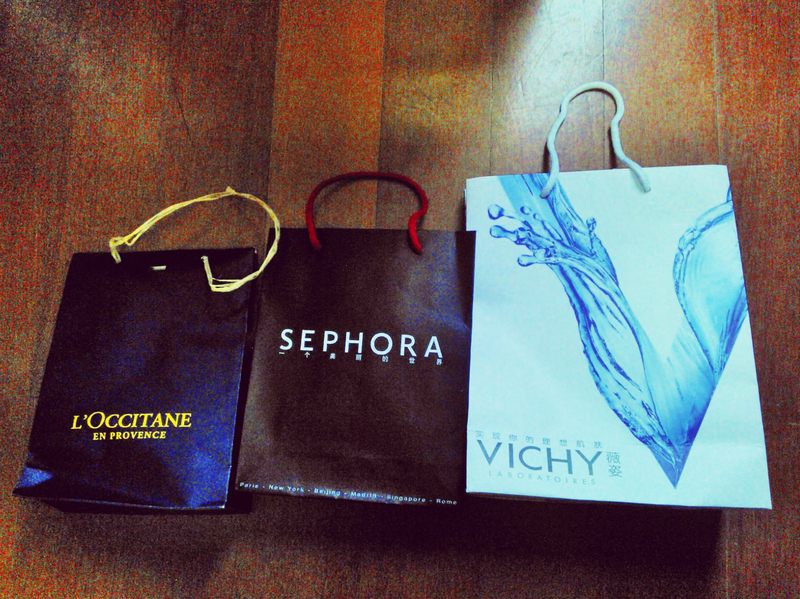 A few weeks prior to that, I also dropped by Vichy to update my skin care products. I’ve been seriously breaking out here, probably because of the air pollution, so I needed to invest more in good skin care products. 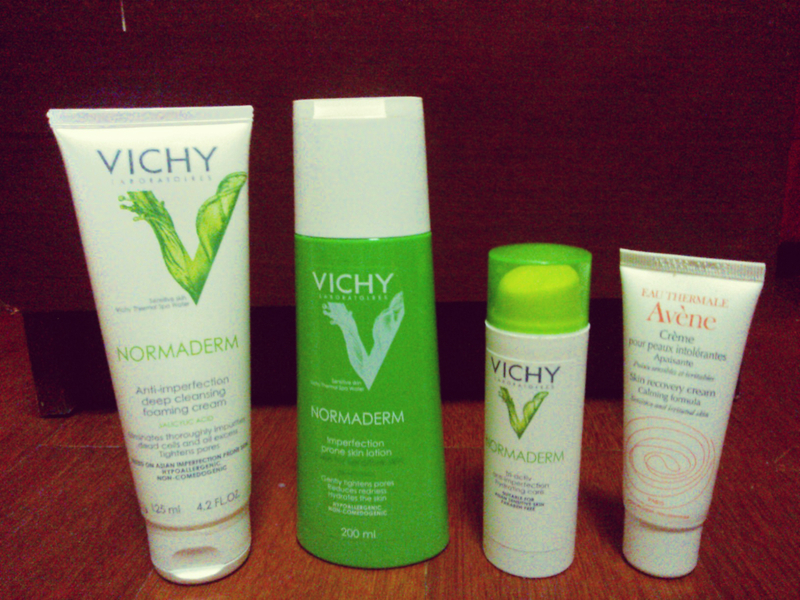 In the end, I bought some items for the Vichy Normaderm line, which promises to combat skin “imperfection.” I mainly bought it for its salycilic acid content, which theoretically helps get rid of pimples. I also threw in Avene’s Skin Recovery Cream to calm my dry and irritated skin. The cold weather’s not been very good to it. 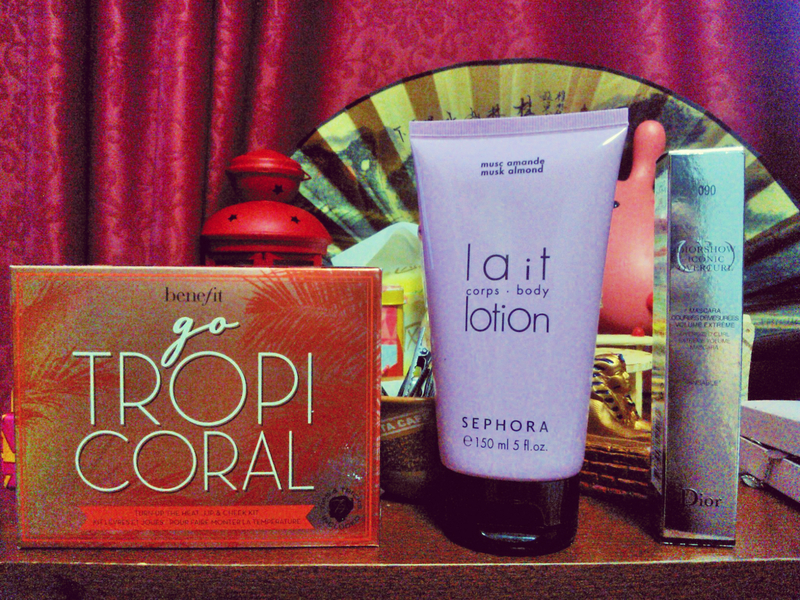 It hasn’t been long since I started using these products so I cannot give a proper review yet. Perhaps I will do so in a month or so. I couldn’t resist getting this Sephora lotion in Musk Almond. It just smells so deliciously good! I’ve been carrying it in my hand bag lately because I’m a lotion addict and every time I rub this on, I just want to keep sniffing my hands! Lastly, I was sold into getting this Diorshow Iconic Overcurl mascara after reading about the Diorshow Mascara in Harper Bazaar‘s list of best mascaras of all time. Wow, that’s a lot of “mascaras” in one sentence! This was horribly expensive, but I am sadly a sucker for advertising. So far, I can say that it is indeed a good mascara, but to be honest, it’s not worth the price tag! 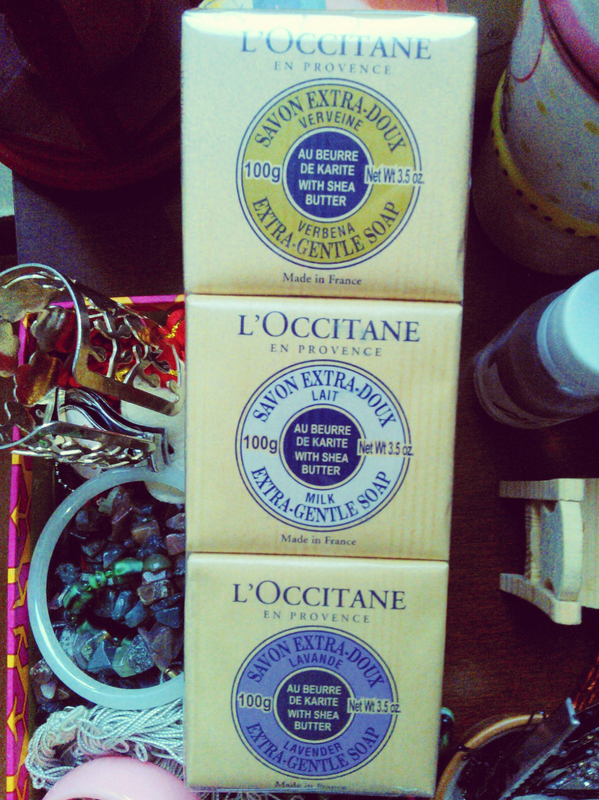 At L’Occitane, I bought this soap trio. I don’t know about you, but I prefer using bar soaps to liquid ones. I always feel slimy after using liquid soaps, whereas I feel squeaky clean when I use bar soaps. I know it’s probably just a psychological thing. Anyway, I’m using the Verbena soap now and its scent is very rejuvenating. It just wakes me up in the morning! Would you like me to do a review about a particular product in the list above? Let me know which one. I’m figuring it’s super cold now in Guangzhou and you need a lot of lotions so you won’t get dryness. Super interested in the Vichy Normaderm line, which promises to combat skin “imperfection. I will be waiting for your review on that. Woah! Hoarding much?! 🙂 I don’t think I can buy that much beauty stuff in one go – it’s usually just one or two products at a time, hahahaha! And I have not tried anything you posted here LOL! What a great buy! 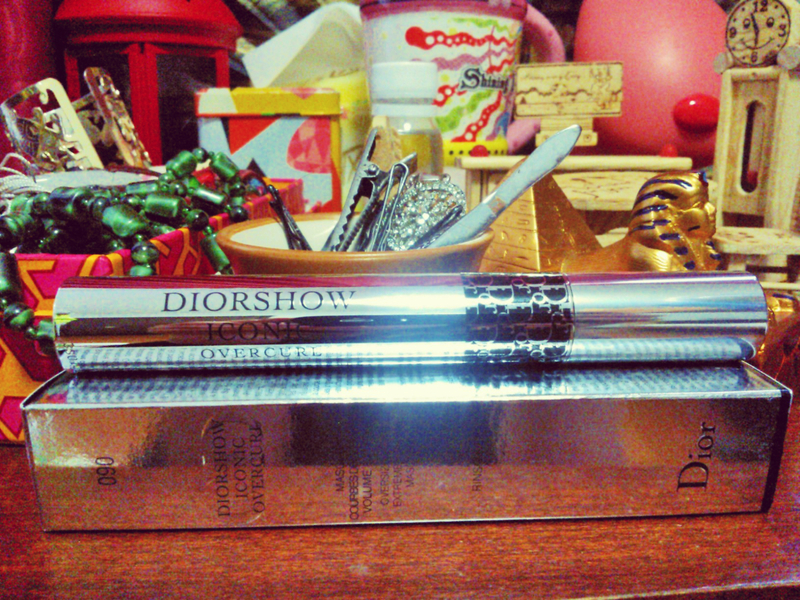 I’m an absolute fan of Dior’s mascaras!! L’Occitane familiar with me. I think I saw it at Beauty Bar. Great blog Mich! 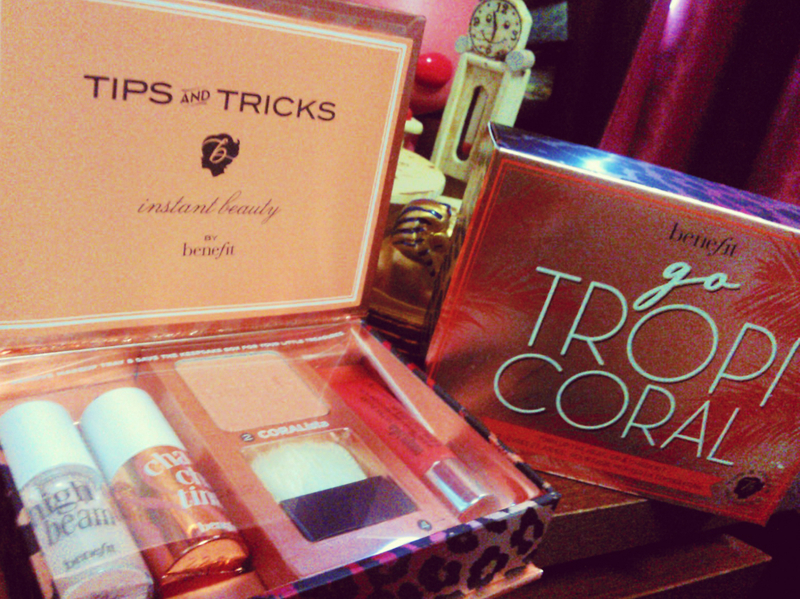 Benefit palettes are such clever creations. I like the one with the Dandelion box o powders included. It’s a pink-themed palette, I think.